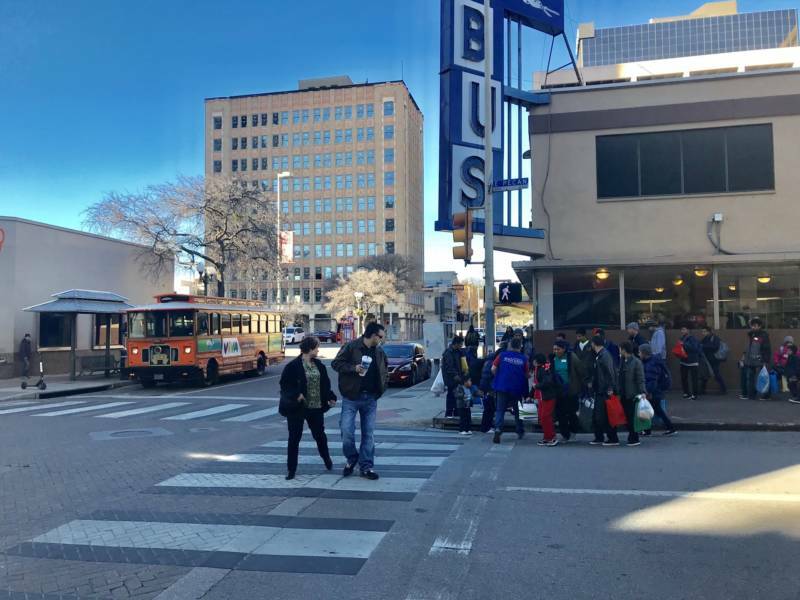 On a chilly January morning, two psychotherapists from the Bay Area arrived at the Greyhound bus station in San Antonio, Texas to meet with dozens of migrant families who had just been dropped off by Immigration and Customs Enforcement officials. The two bilingual therapists, Alicia Cruz and Chris Mullen, have worked together for a decade at Kaiser in San Francisco and see clients in offices right next to each other. They were prepared to put their therapeutic skills to use in the most unlikely place: the waiting area inside the bus station. 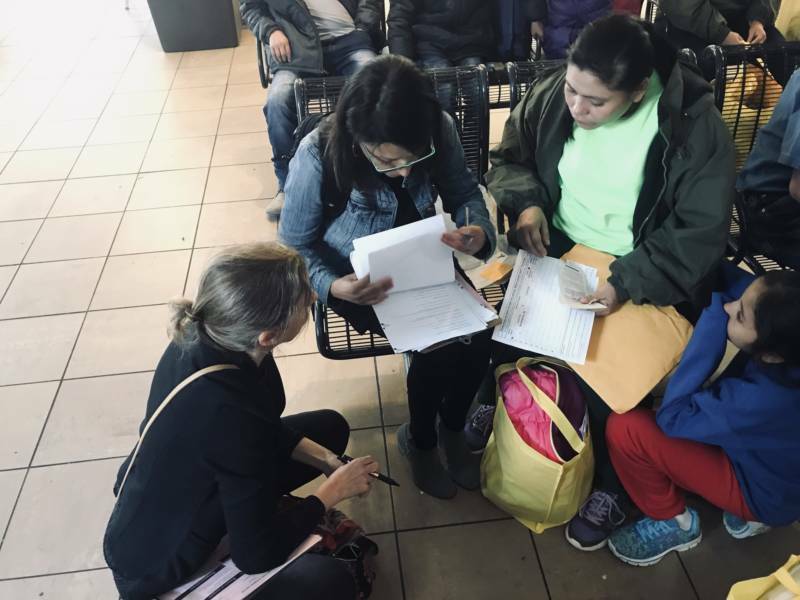 It was easy for the women to spot the parents and children just released from detention: They were wearing brightly colored sweatsuits, parkas and brandless tennis shoes issued to them by ICE. The families were delivered there from the country’s two largest ICE family detention centers, each about an hour away, and issued one-way tickets to travel on to relatives or sponsors around the country. The families crammed onto metal benches, with bags of belongings stuffed under their feet. Several nuns and volunteers from local churches handed out box lunches and backpacks containing toiletries and stuffed animals for the kids. Mullen and Cruz were so moved by news accounts of migrant families being detained at the border, that they used vacation days for the trip, working with RAICES, a Texas nonprofit that provides legal help to asylum seekers. More Central American Families Seek Asylum in the U.S. Although the total number of people apprehended crossing the U.S.-Mexico border has dropped significantly in recent years, the number of families has grown dramatically, from 15,000 people traveling in families in 2013 to 107,000 last year. Most are fleeing gang violence, government corruption or extreme poverty in their home countries in Central America. Last year, after a controversial family separation policy was struck down by the courts, the Trump Administration proposed a plan to hold parents and children indefinitely in ICE custody — part of an effort to terminate a longstanding legal agreement that limits ICE detention of children. But ICE has space for about 3,600 people in its three family facilities and advocates in Texas say the families released at the bus station have typically been held by ICE for a week or two. Cruz said these families have been through a lot. After surviving violence in their home countries, she said, they are often re-traumatized by the dangerous journey here and their time in U.S. detention. Cruz and Mullen handed out plastic bags of Legos to the children so they can play while their parents talk. Most of the migrants don’t want their names used because they fear for the safety of their families. Mullen sat down with a man from Guatemala while his 9-year-old son drew in a coloring book nearby. Mullen asked him why they left home. The father told Mullen that drug traffickers had built landing strips in the jungle near his town and he saw local police driving back and forth each time airplanes landed. One day a friend told him his name was on a government official’s hit list. The next day, that friend disappeared and that’s when he knew he had to leave. As the man spoke, tears dropped steadily onto the sleeve of his jacket. He told Mullen he crossed the border into California last month by climbing a tree with his son clinging to his back and leaping onto the wall, then down onto U.S. soil. The man said he and his son spent six days in a Border Patrol station, where they were given cold bean burritos for every meal, before they were transferred to an ICE facility for fathers and sons in Karnes City, Texas. Now they are heading to the East Coast to stay with relatives while their asylum claim is adjudicated. Under a 1997 legal settlement known as Flores, unaccompanied migrant children are not supposed to be held in US Customs and Border Protection facilities for longer than 72 hours except in “exceptional circumstances,” and they must be provided adequate food and shelter during their stay. But after two children died in CBP custody in December, officials indicated they would work to transfer parents and children to ICE family detention centers more quickly. Earlier this month, the Department of Homeland Security declined to confirm whether that has occurred. 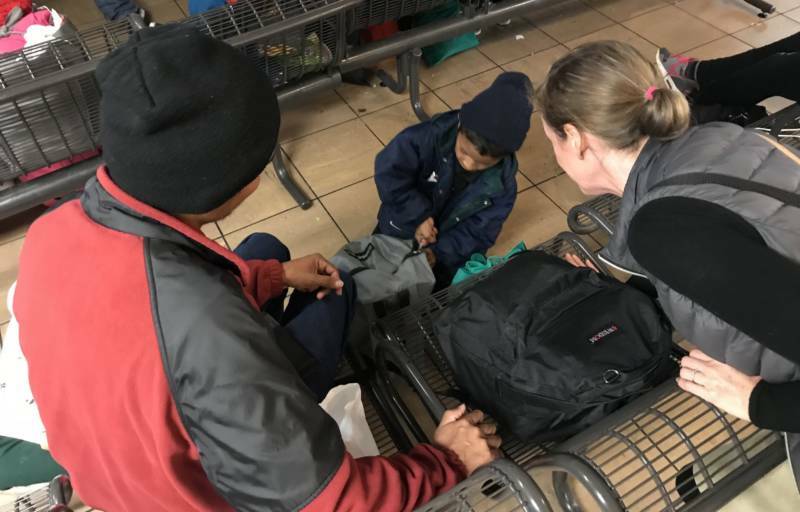 The mother told Cruz that Border Patrol agents locked the family in a cold, windowless room for four days, and only gave them one sandwich and one juice box a day. When her children cried, she said, agents told her to shut them up. “'This isn’t your country',” she said they told her. A couple of hours later, she and her kids boarded a bus to San Francisco, a trip that takes 39 hours. In her pocket was some cash Cruz gave her for meals, along with the name of a trauma recovery center in San Francisco that works with asylum seekers. She and Mullen also know that the migrants will need to be able to talk about their experiences in a coherent and compelling way when it comes time for an interview with an asylum officer. Cruz plans to return to San Antonio as often as she can. Her family and other parents at her son’s school have already donated enough money and frequent flyer miles for her next trip. This story was reported in collaboration with Public Radio International's The World.